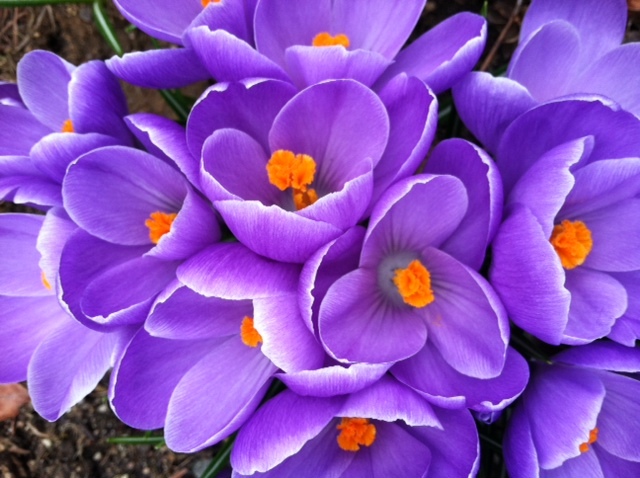 Goodbye Winter Doldrums written by Nancy Weshkoff | Moonflower Yoga Inc. It has been a brutal winter here in Bellmore, on Long Island, New York. Our snow fall totals have already reached approximately 60” and there is another snowstorm on the way later this weekend with the prospect of possibly 10 more inches of snow. Mother Nature has not been kind to us this winter. I am, however, shaking off the winter doldrums. While the temperatures are still cold outside, there are signs of better days ahead. Officially spring is just 3 weeks away. Have you noticed the extra daylight? It is no longer dark at 5 PM. And when the snow is cleared away in my garden, there is beauty coming from the earth. Several of my spring bulbs already have a couple of inches of green foliage. A few of the spring perennials also have some green growth. The robins have returned. The flowers and birds know that spring is just around the corner. There is something wonderful about the prospect of spring. It marks a new beginning. Are you ready for spring? Warmer weather means shedding those baggy, extra layers of clothes that have kept us warm. It is time to start thinking about getting in shape for the lighter clothes of warmer weather. It is a great time to get off the couch, wake up our bodies, and get toned and stretched. If you start now, you’ll feel fabulous and be ready for the warm days which are ahead. Moonflower Yoga has some great yoga classes to help you get in shape for spring. If you have never practiced yoga before, or have been inactive, start slowly with one of our fantastic beginner yoga classes which are offered several times a week. We have lots of props on hand to help our students as you are getting back into shape. Ready for something more challenging? Try our Stress Reduction Vinyasa Flow class on Monday night at 7:30 PM or Sunday Flow at 9 AM each Sunday. We also added a wonderful Move and Stretch class to the Tuesday schedule at 6:15 PM, and there is a fun Stretch and Flow class every Thursday morning at 10 AM. We have an Iyengar-style Level One class on Tuesday at 10 AM and Thursday at 6:45 PM to help you tone. If you are working in the vicinity of Bellmore, Long Island, we added a Yoga Lunch Express class on Mondays at 12:30, which is a great 45-minute lunch class: skip the heavy calories and try a wonderful class to energize you. Remember spring is just around the corner. It is time to shake off your winter doldrums! Come visit us at Moonflower Yoga in Bellmore, New York, in Long Island’s Nassau County, for a great yoga class with our dedicated team of yoga teachers to help you get into shape and feel great. Hope to see you soon!